The newly infamous Trump Baby balloon could soon be flying high above protestors in Philadelphia. This week President Donald Trump was faced with tens of thousands of protestors throughout his travels in the UK. The most defining image of the gatherings? The 20-foot tall balloon depicting an angry, orange "Baby Donald" clad only in a diaper and holding a cellphone. The blimp made its first appearance Friday, flying above Parliament Square in London. An estimated 250,000 people protested the area during Trump's visit. The balloon then followed Trump to Edinburgh on Saturday during a protest that drew about 10,000 people. In an interview with the Sun published Friday, Trump told the paper that seeing the balloon made him feel unwelcome. "I used to love London as a city," he said. "But when they make you feel unwelcome, why would I stay there?" Though the blimp, designed by Leo Murray, struck inspiration for protestors in the U.K., it's striking a chord for activists in the U.S. as well. Inspired by Murray's design, Didier Jiménez, a social worker and activist in New Jersey, put together a GoFundMe page attempting to raise $4,500 with the goal of bringing the blimp to America. After going live Friday night, the goal was reached -- and then some -- in less than 24 hours. As of noon Sunday, the campaign had raised $5,211 from 228 donors. "I saw [the balloon] online and thought, that activist really gave us a tool," Jiménez told PhillyVoice. "Humor is a big tool, and we know from the correspondent's media dinner in D.C. Trump has a thin skin and can't deal with being ridiculed," he said. Jiménez is now working with activist group People's Motorcade to orchestrate the balloon's rise, which is planned to begin in New Jersey. Jiménez told PhillyVoice that they are in talks with farm owners in Bedminster, N.J. who own land not far from the area's Trump National Golf Club. 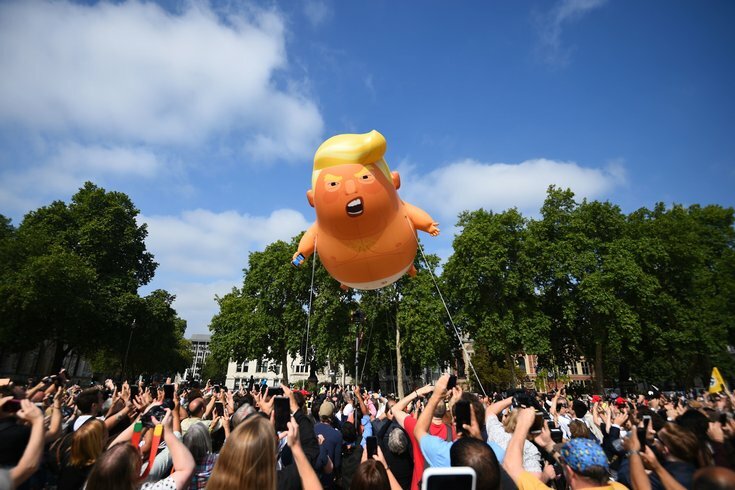 The balloon's manufacturer, who built the Baby Trump seen in London, will start work on the U.S. balloon Monday, Jiménez said. It will then take about four weeks for the balloon to arrive in New Jersey. They hope to have it ready to go by mid-August. To begin with, organizers want to coordinate the balloon with a visit from Trump to the golf course. After that, organizers -- and Baby Trump -- plan to hit the road. "We plan to go on tour to New York City and down the East Coast," Jiménez said. The tour would include a stop in Philadelphia. "We plan to reach out to progressive candidates there and down the coast." There is also a social media account in the works so people can follow along on the whereabouts of the Trump balloon. "At protests, we hope to engage in conversations with folks about how to combat the terrible policies enabled by Trump and how we can support new progressive candidates," Jiménez said. "I believe I will get emails and threats about what I am doing, but I believe we need to have courage and stand up to fascism and hate." Learn more about Baby Trump in the U.S. on the project's GoFundMe page.